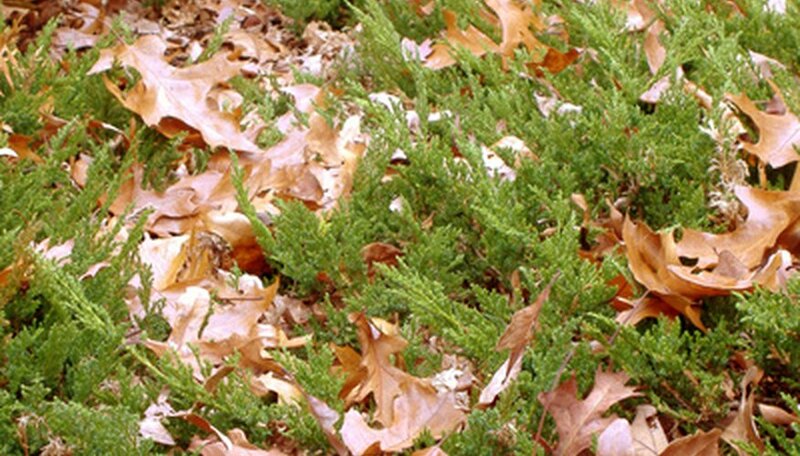 Juniper is a creeping, feathery ground cover that turns purple in cold weather. It is heat and drought tolerant and ideal for a low-use area of a garden. You can choose from numerous varieties of juniper in an assortment of sizes; some stay quite short, but others can grow to 3 to 4 feet in height. Juniper thrives in full-sun locations in sandy soil and is hardy in USDA zones 3 to 10. Because juniper seeds can take up to five years to germinate, juniper is generally propagated using cuttings. Take your juniper cuttings in the fall. Take a hardwood cutting from the juniper. Look for older growth on the plant that is woody, and cut right above a leaf node (where the leaf joins the stem). Cut a piece that is 4 to 6 inches in length. Remove all but the top two or three leaves. Pour coarse sand into a planting pot that has holes in the bottom for drainage. Water the soil until it is completely wet, allow it to drain and then water it again. Make sure that it has completely drained before you plant your cutting. Poke a hole in the sand with a pencil or your finger for the cutting. Pour a small amount (about the size of a dime) of rooting hormone into a dish. Dip the cut end of the cutting into the rooting hormone. Dispose of the remaining hormone. Place the cut end of the cutting into the hole in the sand, and pack the sand around it. Place the cutting in a shady area, mist it with water daily using a misting bottle and make sure that the sand stays moist. Your cutting should root within 12 weeks.